Never Enough Nails: Sally Hansen Rock of Ages Salon Effects in Red-y to Rock! 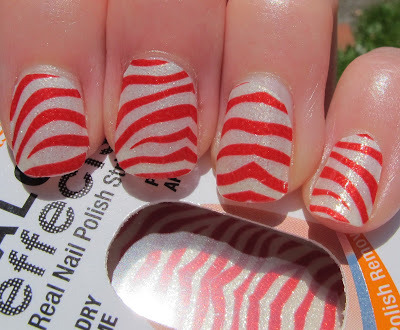 Sally Hansen Rock of Ages Salon Effects in Red-y to Rock! By now, you all have probably seen the previews for the Rock of Ages movie (I believe it is in theaters now!). Like most important movies of today, this movie ties in with a nail polish release!! 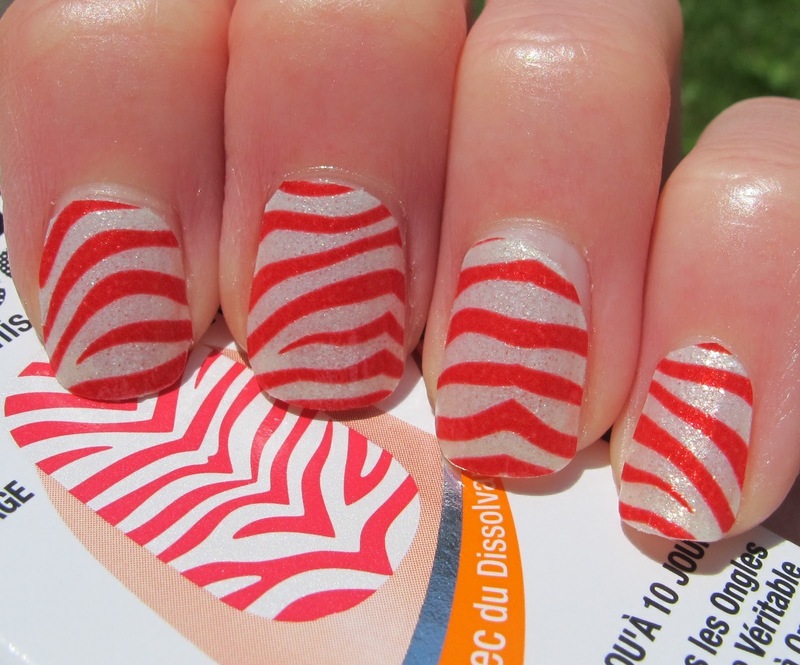 Sally Hansen came up with some Rock of Ages inspired designs, including today's mani, Red-y to Rock. I tested out the strips today, and if I go see the movie, you can be sure I'll be wearing Red-y to Rock! I love this red and white zebra-ish wave design. These are sparkly polish strips, as you can see below. The white waves are especially sparkly. I really like the nail polish strips that are sparkly best. 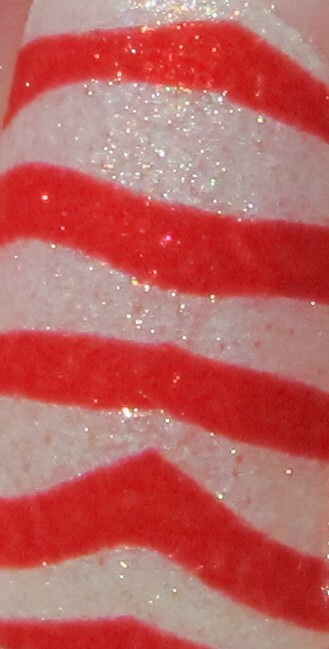 The creme design ones are fine, but really, who doesn't want a bit of sparkle?? These polish strips were SUPER easy to apply. I have always thought that Sally Hansen Salon Effects were easy to use, but they might have gotten even easier. The excess strip filed off so cleanly! I only did four nails for these pictures and I think it took me all of 1 minute to do this. Maybe less. I have worn Sally Hansen Salon Effects for 5 days in the past with only a tiny bit of visible wear. With the addition of a clear top coat, they can last even longer. So while $9.99 may seem pricey, they are an excellent choice for a vacation when you really don't have time to do your nails. Plus, $9.99 is WAY cheaper than something like a gel manicure that would last 7-10 days. And I really just LOVE the designs that are available!! Sally Hansen Rock of Ages Salon Effects are available now at drugstores! Wow, the sparkle really does add a lot to these! Yea, it definitely makes these different than some other ones I've seen. Have you tried the Sally Hansen Salon Effects yet? ?